We met Syeda Ghulam Fatima in April 2016 in Yerevan, Armenia, where we traveled to attend the presentation of the “Aurora Prize for Awakening Humanity”. The Armenian businessman and philanthropist Ruben Vardanyan, creator of the award along with Vartan Gregorian, Noubar Afeyan, sent us the invitation through the Raoul Wallenberg Foundation, an educational NGO, chaired by Eduardo Eurnekian and created by Baruch Tenembaum. 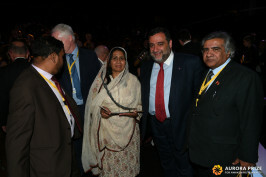 The Aurora Prize for Awakening Humanity is granted annually to an individual whose actions have had an exceptional impact on preserving human life and advancing humanitarian causes that improve the lives of unprotected people, by rescuing them from slavery conditions, providing medical care in the frontlines or hosting refugees, among other solidarity actions. This line of work is also the driving force of the Raoul Wallenberg Foundation, an educational NGO that, along with the Holocaust, Genocide and Anti-Discrimination Chair of the University of Buenos Aires, develops the “Houses of Life” program, an initiative that takes place in Europe with the mission of identifying, paying tribute and promoting worldwide the actions of institutions or individuals who stretched a caring hand to those persecuted by the Nazis and their allies during the Holocaust. “More than 70 years since the end of WWII, the goal of this initiative is to thank those who risked everything to help their neighbor.” says Eduardo Eurnekian. 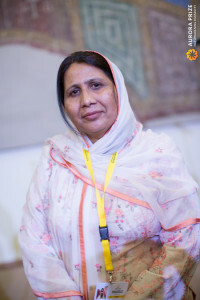 Syeda Ghulam Fatima is world renowned for its social activity in Pakistan, work that allowed her to be a finalist for the prestigious “Aurora Award”. She is the face of the Bonded Labour Liberation Front (BLLF), an organization to which is the general secretary. When Syeda was a teenager, she witnessed something that no child should see: the face of slavery. She was surrounded by people whose haggard faces reflect the pain and loss of self-respect, stripped by violence of a savage labor regime. They had been deprived of their dignity in the brick kilns of Pakistan, forced to work at gunpoint from sun to sun, mercilessly. Young, old, children, men, women, all tortured by rich landowners who exploited, killed and raped at will, in an environment of misery, squalor and unspeakable submission. In a regime of super-exploitation without any control by the authorities, whole families are forced to get from their employers loans at extortionate interest rates that impede their cancellation and tied the fate of the family to the will of the loan shark. Children are also forced to work, without getting an education and in inhumane conditions. In order not escape from the yoke of the oppressor, if a family wants to leave temporarily the neighborhood, a member should always stay as a guarantee that the other will return. “One day, after witnessing countless injustices and abuses, I decided to start working to free as many people as possible. It was the love and affection of the workers what inspired me, despite I knew that my life would be in danger. The smiles and prayers of the slaves after been freed are the stimulus that feeds my determination.”, says Syeda. Syeda considers her work far from finished. The experience of long-term abuse is a lasting wound and is embodied in the case of a four year old girl, unable to eat, or even mourn for several weeks after being released and taken to a safe place. Syeda later learned that the girl had been systematically beaten by the owner of a furnace every time she cried for food. In the course of her struggle, Syeda and members of her family were victims of attacks and beatings. To date, however, her tireless work has rescued about 80,000 people, including 21,000 children, approximately.